University of Kentucky researchers participating in a Department of Energy-funded center have discovered a ground-breaking process that allows them to harness energy from chemical reactions that previously would have been dismissed as unusable. The process – which maximizes the efficiency of reactions at the molecular level – could affect everything from synthetic biology to fuel and chemical production. The authors are part of a multi-institutional team called the Biological Electron Transfer and Catalysis (BETCy) Energy Frontier Research Center. The Center is headquartered at Montana State University, and the key authors of the paper are at the National Renewable Energy Laboratory (NREL) in Golden, Colo., MSU, Arizona State University, the University of Georgia and the University of Kentucky. BETCy was launched in 2014 and is one of 32 Energy Frontier Research Centers throughout the U.S., all focused on laying the scientific groundwork to meet the global need for abundant, clean, and economical energy. Their findings have recently been released in the journal Nature Chemical Biology (vol 13, pp 655-659). In the Nature paper, the BETCy team has characterized for the first time ever a process by which a single enzyme is able to tie together two sets of electron transfer processes, forcing the favourable series of transfers to provide energy to drive an unfavourable electron transfer, in a process called electron transfer bifurcation. The upshot is that the enzyme is able to upgrade the energy associated with one electron, thanks to expenditures of another. This versatility enables enzymes to 'save up' excess energy from favourable electron transfers and apply the energy saving to another reaction. Moreover the 'upgraded' electrons make possible chemical reactions that would otherwise be impossible for the organism. An important example is nitrogen fixation. Nitrogen is essential for all life and abundant in the atmosphere as N2. However few organisms can convert N2 to biologically-tractable ammonia (NH3), also known as 'fixed nitrogen'. Availability of fixed nitrogen limits our crop yields and thus our ability to feed the human population. The reaction by which plants and bacteria fix nitrogen is made possible by the electron bifurcation reaction that the researchers have now explained. The BETCy researchers have shed new light on mechanisms by which flavin coenzymes within a bifurcating enzyme separate the paths of two coupled electrons and concentrate their energy in just one of them. The researchers have shown how flavins (derivatives of vitamin B2) can serve as catalysts for these reactions, using spectroscopic methods able to monitor the progress of the reaction on a time scale of picoseconds and even smaller time intervals. 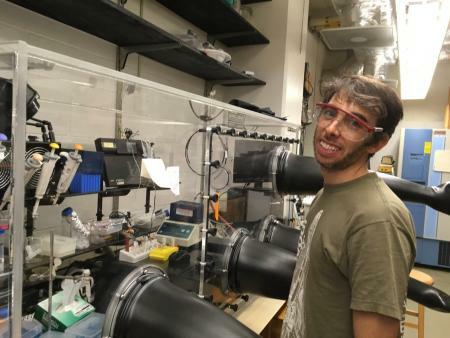 Chemistry graduate student John P. Hoben and Prof. Anne-Frances Miller of the University of Kentucky have used steady-state spectroscopic methods including absorption, fluorescence and others to characterize and quantify flavins in bifurcating enzymes. The paper is now accessible via http://www.nature.com/nchembio/journal/v13/n6/full/nchembio.2348.html.